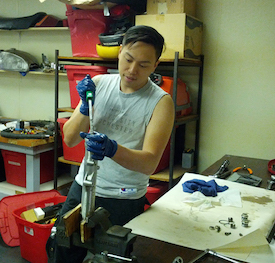 The Common Motor Collective is a DIY cooperative motorcycle and mechanics workshop. The focus is a learning environment where members can work on their own motorcycle / engine projects as well as learn how to use shop tools and perform basic fabrication.The shop philosophy is to teach good technique in order to make one a completely self sufficient mechanic. 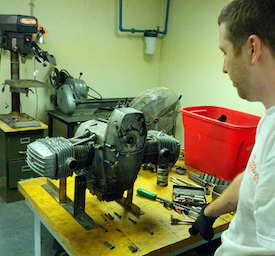 CMC members have enjoyed the ability to repair and build their own motorcycles in a guided community environment. In the shop we have one motto: Fix – Ride – Modify. CMC members can rent out bench and project storage on a monthly basis. Rental includes access to shop work space, equipment and tools as well as bike and parts storage. Shop access is three days a week and is supervised by experienced members. Day and time schedules are arranged based on members needs and availability, including weekends. Members must also complete a mandatory shop safety orientation and are expected to contribute to the upkeep and well being of the shop space, fellow members and the cooperative as a whole. Spaces are limited, contact us directly for additional information or to schedule a visit. The best way to get started wrenching is with some real hands on time with an experienced mechanic. Individual lessons are one on one with an instructor, in which you and the instructors work together on your motorcycle. A professional evaluation of your motorcycle will be done and a repair plan of action will be created for your specific project. Lesson rates vary based on lesson length. Evening and weekend time slots are available. Contact us directly for inquiries and availability. If you're local to Houston and need parts, give us a call you can stop by the shop and pick them up. We love talking with riders that like to wrench on their own bikes, happy to show you around the shop too.